A close relative to the Accordion and Concertina the Bandoneon became popular in the 1890’s in South America due to its perfect compatibility with the rhythm of the ‘Tango’. 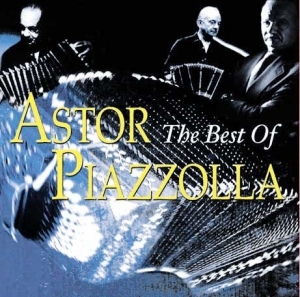 Without doubt the most famous Bandoneon player was Astor Piazzolla. This album features recordings from an interesting later period in his career. Tracks 1 and 2 are from the 1976 Italian movie ‘Cadaveri Eccelenti’ whilst tracks 3 through to 7 come from the1985 Italian cult movie ‘Henry IV’. Tracks 8 and 10 are with his quintet and track nine is the original version of the inspiration for the Terry Gilliam 1995 movie ‘Twelve Monkey’s and to round off this very rare collection is Astor’s flirtation with early seventies jazz rock.